It was the autumn of 1960 in Hamburg, Germany. The young, fledgling group who had recently changed their name officially to “The Beatles” were playing at a local club called The Kaiserkeller. Hamburg was a vice-ridden city, a 24-hour-a-day unofficial red light district in itself. Hookers, pimps, thugs, gangsters, drug dealers, and various sundry “characters” and habitues roamed the streets during the day, and came to the clubs to hear the raucous music and bands a night. At the time, the Beatles consisted of five members- John Lennon, Paul McCartney and George Harrison, plus their then-drummer Pete Best and their pretty mediocre bass player, Stu Sutcliffe. Rory Storm, the Hurricanes’ front man and lead singer, was a very colorful fellow who stuttered in real life, but was able to sing clearly and plainly. In fact, his stutter was so bad that his friends often wouldn’t let him do things like order in restaurants or introduce songs during the act because it took too long. The members of the two bands got to be good friends during their time playing together. They all lived at the “Seaman’s Mission” and would join together to go out for breakfast at “Harold’s Cafe” next door after the long nights, devouring Corn Flakes and milk (pretty much the only real nourishment they got, after drinking bottles of beer and taking pills called Preludin (“Prellys”) to stay awake through the night. The boys also all indulged in the local prevalence of both local girls (“groupies”) and local prostitutes, as one could imagine red-blooded young musicians in their late teen years would. During these 8-hour shifts, the Beatles would play for a stretch, take a break (a “Powzer”) and Rory and his boys would take over. The stage of the Kaiserkeller was nothing but a bunch of wooden planks balanced on beer crates. The Beatles and the Hurricanes once made a bet to see which group could break through the Kaiserkeller stage. After several failed attempts to crash through, the Hurricanes finally won the bet, stomping and jumping as hard as they could, before smashing through and laughing in the rubble. When the two bands went out to breakfast the next morning at Harold’s Cafe, he sent a group of his henchmen over to beat them with blackjacks. The Beatles were to have many wild and crazy times in Hamburg, but more importantly, it was in Hamburg that they really started to “come together” and gel as a band. One day, unknowingly at the time, musical history was made. On October 18, 1960, one of the Hurricanes named Lu Walters was scheduled to record a few songs at a local studio. 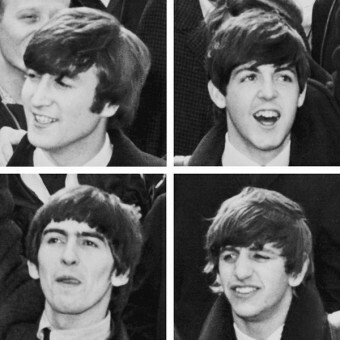 John, Paul, and George were hired, for a modest fee, to accompany him and provide instrumental backing. The session took place in a small booth on the fifth floor of the “Acoustik Studio”. Three songs were recorded that day: “Fever”, “Summertime” and “September Song”. This session was to be the first time John, Paul, George and Ringo ever played music together. The session ended and the three Beatles and Ringo went their separate ways. But on several occasions over the next year and a half, when Pete Best was ill, indisposed, or otherwise unavailable, Ringo would climb aboard his drum kit and sit in for him. On February 5, 1962, Pete Best was ill and Ringo sat in for him at a lunchtime gig at a local club, The Cavern. He played with the boys again that same evening at another gig. Finally, in mid-August of ’62, Ringo was officially asked to become a “Beatle” and permanently replace Pete Best. At this same time, Ringo had been offered 20 pounds a week to play for another band called “Kingsize Taylor and the Dominoes.” The Beatles offered him 25 pounds, so he took the Beatles offer. Rory storm was also angry at first, but being a very decent chap, he ultimately wished Ringo and his new band good luck. We all know what was to become of John, Paul, George, and Ringo. They, of course, went on to unimaginable riches, fame, and glory, revolutionizing music and bringing joy into the lives of untold millions all over the world. The luckless Pete Best was to join a band called “Lee Curtis and the All-Stars”, which met with little success. Finally, in 1968, Pete retired from show business and got a job in a bakery. Fortunately, although it took a few decades, Pete was to get his much-deserved millions when a few recordings he had played on were released in the Beatles “anthology” in the mid-1990s. Pete started performing again, had a happy marriage and managed to somehow survive happily after the biggest screw job in the history of show business. With the Beatles huge, unprecedented success, many other groups close to them were to also meet with success, riding their huge coattails. Unfortunately, Rory Storm and the Hurricanes were not to be one of them. Rory and his Hurricanes were to go through several drummers in the next few years. But Ringo Starr was to prove irreplaceable. After a few failed records, he returned to Liverpool and was still a local star. But finally, after a band member died, his Hurricanes officially disbanded in 1967 at which point Rory took on a new career as a disc jockey. To compound his tragic end, Rory’s mother found his dead body in the home they shared and committed suicide herself. If this isn’t a big enough downer, the Beatles’ original bass player, Stu Sutcliffe, was to die at the age of 21 from a brain hemorrhage resulting from an injury he incurred at a local concert. The lives of pretty much the entire world were to be affected by the Beatles and their music- and the Beatles themselves each had their own particular up-and-down journeys after the group’s break-up in 1969. John finally found the life he was always searching for in bizarre Japanese artist Yoko Ono, who was to become his wife and close companion. George found his salvation in Eastern religion and philosophy. Paul and Ringo have each been through their own share of misfortune too, but are both still very active as performers, as well as apparently happy in their personal lives. Who could ever have imagined the repercussions and ramifications of a minor recording session at a cheap, little-known studio called “Kirchenalle” (The Klockmann House)- the day it all started- all those many years ago? Mark David Chapman was convicted for murdering John Lennon on December 8, 1980. Chapman remained at the scene reading J. D. Salinger’s novel The Catcher in the Rye until the police arrived and arrested him. Chapman repeatedly said that the novel was his statement.